Claustrophobic, menacing and utterly creepy, the stage version of The Woman in Black was one of the most enthralling theatrical experiences I've ever had, so I had high hopes for this latest outing from the newly relaunched Hammer studio. Okay, I'll be honest, I wasn't scared. But that put me in a minority of one in my local multiplex – and how marvellous that, no doubt drawn by the presence of Harry Potter himself in the lead role, the cinema was full of kids and teenagers gasping, screaming and hiding their eyes from this beautifully made British 12A gateway horror film. Who needs American remakes? 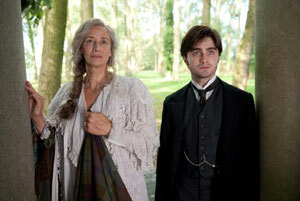 Daniel Radcliffe plays widowed lawyer Arthur Kipps, despatched up to the Grim North East by an unsympathetic boss to settle the affairs of the recently deceased Alice Drablow of Eel Marsh House. If you Google 'haunted house', you get a picture of Eel Marsh House, a gloomy, Satis House pile decaying slowly into the marshes, attached to the mainland by a narrow, desolate causeway. And (of course) the house harbours a terrible secret, a vengeful ghost who blights the lives not only of the local villagers but of all who approach her lair. If you're not familiar with the tale, I don't want to give away too much. Suffice it to say that, although the film may wander from the plot of the stage play and original classic ghost story by Susan Hill, it retains all their unsettling eeriness. Eschewing expensive CGI effects in favour of fleeting horrors flickering almost imperceptibly round the edges of the screen, sudden heart-in-mouth shocks and that old favourite scary chestnut, hollow-eyed dead children and creepy Victorian toys. Ooh yes! Daniel Radcliffe struggles manfully to set aside 12 years of boy wizardry and allow us to see him in a new light, as a bereaved, grieving husband and devoted father. And he more or less succeeds, carrying the film unexpectedly convincingly – even if you do occasionally expect him to raise his wand and whisper 'lumos' as he peers into the dark, spooky corners of Eel Marsh House. Like Harry morphed into The Wicker Man's Sergeant Howie, he remains a stoic, noble everyman in the face of some fairly crazy, local yokel hostility and a marvellously mad scenery-chewing performance from Janet McTeer. 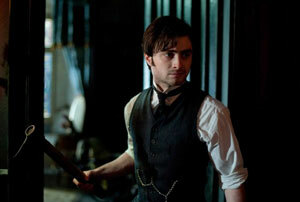 So although The Woman In Black doesn't hold many shocks for a seasoned horror fan, it yet is such a delightful distillation of everything that made old school Hammer films so great – pitting stiff-upper-lip British values against supernatural terror to a backdrop of creepy goings-on, accompanied by the ominous, elliptical mutterings of curmudgeonly villagers – that I couldn't help but love it. And if you're a fan of Hammer classics such as Dracula, Prince of Darkness or The Witches, or if you enjoy recent ghostly outings The Orphanage or The Awakening, you may well love it too.